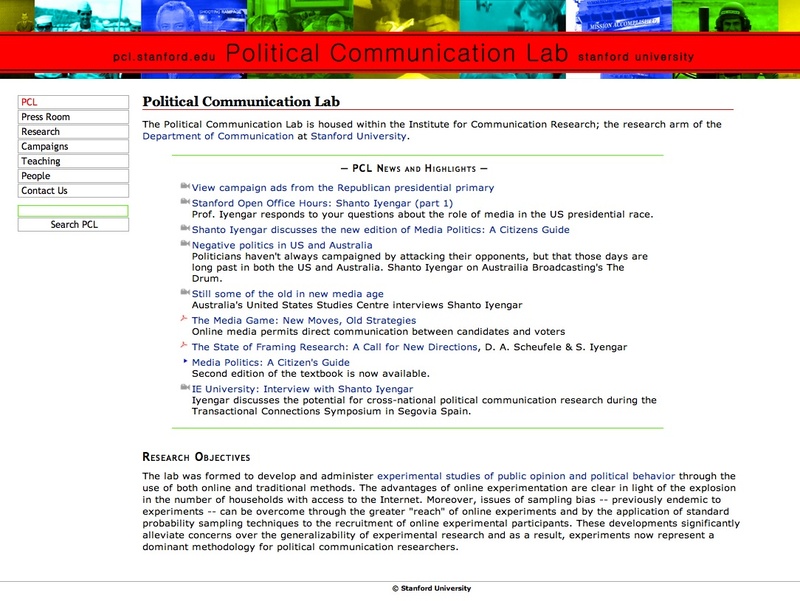 The Political Communication Lab is housed within the Institute for Communication Research, related to the Department of Communication at Stanford University. It was formed to develop and manage experimental studies of public opinion and political behavior through the use of both online and traditional methods. The Lab publishes on this website its experimental works, papers, teaching material, talks, samples readings, as well as a large multimedia collection of records from the latest US elections: issues positions, campaign ads, commercials, speeches, debates, interviews and media contents are available online. Each item is accessible in its original format (text, audio or video), sometimes also in Spanish, and no subscription or fee is required for access and downloading. Recent entries include a collection of 2008 Presidential campaign ads and a booklet titled “Media Politics: A Citizen’s Guide”, available in a new edition. There are no navigational aids nor search option available, but nevertheless the website is easy to navigate thanks to a straightforward and pleasurable structure.